Are these pixels hot, or not? Hot Pixel is a collection of bite-sized minigames for the PSP infused with an urban/skater theme. 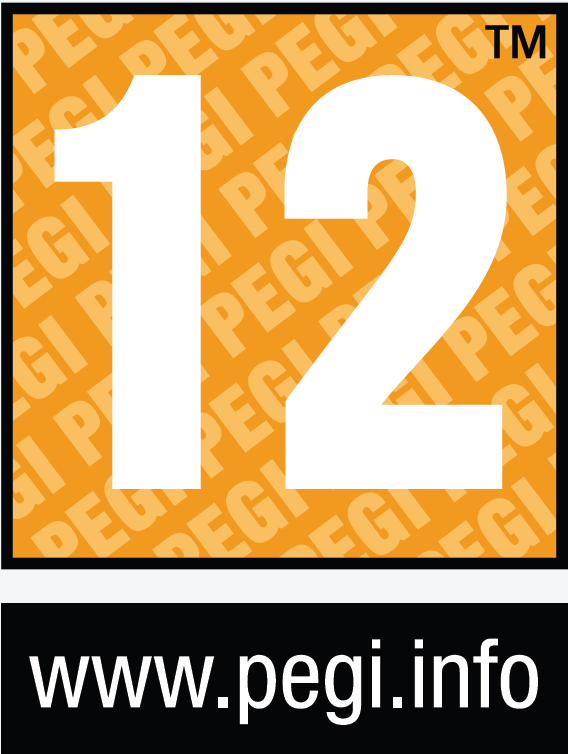 There are around 130 minigames included and 70 more available to download for free from www.hotpxl.com. The title is often compared to the Warioware series and it is a fair association as both games nearly share the same premise. Where they differ is that Hot Pixel is less polished, less inspired, and an overall far less enjoyable game. Viewing it on its own merits it doesn’t fare any better, as the whole experience lacks direction and is too short to leave any lasting impact on the player. The meat of the game is the ten featured episode sets, each consisting of about 10 or so 10-second minigames followed by a boss stage. Minigames are played in succession and begin with a short explanation detailing what you are supposed to do in order clear the challenge. For instance, one minigame orders you to “eat only pink,” casting you as a single blue pixel that must traverse a stage while eating all the pink pixels and avoiding black pixels all before the time expires. Part of the challenge is figuring out what to do and most of the time it’s simple enough. Later on you will encounter another minigame with the same "blue pixel eat pink pixel" setup, only slightly altered. Slowly it will dawn on you that you have been playing variants of the same game over and over again and what little fun you may have been having dissipates. That isn’t to say that all 200 games are as monotonous. A fair number are genuinely fun and creative, such as the game that has you following simple button commands to transform a hand-drawn robot into a giant mech. This challenge too has its variants but it is charming enough to put a smile on your face each time you play. It’s games like these that Hot Pixel needs more of, because the collection is inundated with games that are either mediocre or blatantly terrible. Some games rely on old clichés like memorizing and matching patterns or playing block breaker. The game is be controlled by the face and shoulder buttons along with either the D-pad or analog nub. Some of the time the X button will be the only one needed to win and when it is, it’s obvious. Most games however, require use of the D-pad or the analog and for certain games one works better than the other. In these situations it isn’t quite as obvious which is the better option, which can mean the difference between success and failure. For the most part though, the controls won’t be a problem. The aforementioned ten episodes haphazardly try to tell the story of a skater named DJON. Each episode loosely follows some sort of theme such as Mental Tuning or 24/7 Music. The minigames don’t exactly follow the theme of each episode so don’t expect to solely play music based games in 24/7 Music. At the beginning and end of each episode a video showing the wacky exploits of DJON will play but there is no explanation as to what is going on or why you should care. What is clear is that these videos fail completely in their attempts to amuse you, making them seem unnecessary. Some of the minigames attempt to execute the same brand of humor as the videos, with similarly poor results. Having an obese man run away from diet food is perhaps worth a chuckle the first time but not the second or in any of the five or so variations on this premise. I will admit that a few jokes do hit the mark, like seeing the walk and don’t walk signals kung fu fighting each other, but most of the time the game attempts to be as over the top as possible, failing to realize it just isn’t as funny or charming as it believes. 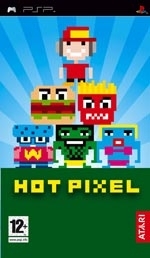 The game is called Hot Pixel in reference to the retro pixelated style of the visuals. Every game doesn’t necessarily share the same graphical appearance but they are all 2D. The visuals don’t exactly push the system, yet load times pop up before and after each episode or play list. Because this game is published by Atari, many references are made to games of the 2600 era such as Asteroids or Battlezone. The first few times these retro throwbacks pop up you can’t help but feel nostalgic for the simple graphics and gameplay, but like everything else about Hot Pixel, you will tire of them quickly. The soundtrack is decent, featuring tracks that mimic the retro and urban attitude of the title. The rest of the audio design mixes the familiar blips and bloops of old with modern sound bits where appropriate. 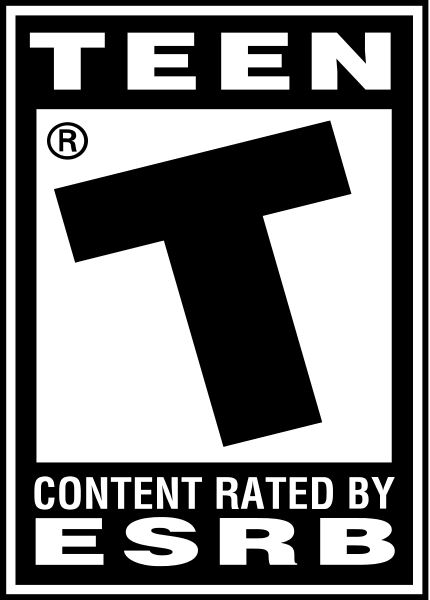 Sadly, the game’s greatest flaw is the lack of compelling content. The 10 episode will take at most an hour and a half to complete on all three difficulties. Other game modes include instant play or play list which allows you to customize the games you play. Xtra Games, as they are called, are ten expanded minigames, most of which are just the boss battles all over again. The best Xtra game happens to be a side scrolling shooter featuring a cheeseburger, and I say best in the sense that the others are uninspired. There is a training mode in case you want to improve your skill at a particular minigame, and ad hoc multiplayer is available should you want to share the monotony with a friend, only laggier. Three to four hours is the best you could hope for the game to hold your attention, which really makes it feel like the game should have been downloadable rather than on a UMD. Hot Pixel is a woefully bad game. If only the developer had spent more of its creativity thinking up better minigame ideas or adding more content than trying to be funny, we probably would have a game that has less fun with itself and provides more for the player. The game can be an enjoyable distraction for an hour or so but longer than that, there just isn’t any reason to keep playing.